Ahh, the general election; a time for debates, campaign speeches, empty promises, and self-important, D-list celebrities threatening to emigrate if the rest of us don’t elect the person they want to see in office. There’s precious little to match the scale of narcissistic arrogance and imagined relevance required in order to publicly declare that if the nation doesn’t agree with you and vote for your candidate of choice then you’re going to deprive them of the luxury of your continued presence in their country. Since we’re talking about Katie Hopkins (a copy of the Daily Mail made flesh), narcissistic arrogance and imagined relevance are scarily abundant and, having declared her intention to leave the UK if Labour are elected in May, she is following the likes of Paul Daniels (who didn’t leave), Andrew Lloyd-Webber (ditto), Phil Collins (who did, for tax haven Switzerland), and Jim Davidson (who left for Dubai in 2004, but that was probably when he discovered he could blacken his wife’s eye there and no-one would mind). If you want to give Katie a helping nudge towards the airport (and who doesn’t? 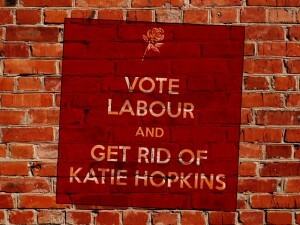 ), scroll down the page and download an MP3 that we guarantee will put a spring in your step as you cast your ballot for Ed Miliband, and a smile on your face as you imagine that one-way plane ticket arriving on Katie’s doorstep. Oh, and don’t forget to go and subscribe to our YouTube channel while you’re at it! UPDATE: You can now download this song on “Planned Obsolescence: The Topical E.P” along with four other fantastic tracks!